IMAX is a motion picture film format and a set of proprietary cinema projection standards created by the Canadian company IMAX Corporation. IMAX has the capacity to record and display images of far greater size and resolution than conventional film systems. Since 2002, some feature films have been upconverted into IMAX format for display in IMAX theatres and some have also been partially shot in IMAX. IMAX is the most widely used system for special-venue film presentations. As of September 2011, there were 583 IMAX theatres in 48 countries. The desire to increase the visual impact of film has a long history. In 1929, Fox introduced Fox Grandeur, the first 70 mm film format, but it quickly fell from use. In the 1950s CinemaScope (1953) and VistaVision (1954) widened the image from 35 mm film, following multi-projector systems such as Cinerama (1952). While impressive, Cinerama was difficult to install, and the seams between adjacent projected images were difficult to hide. 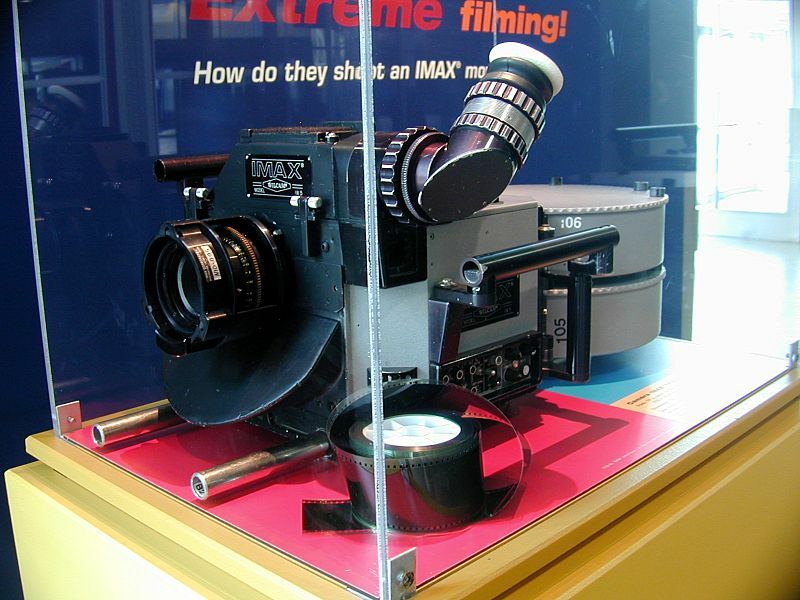 The IMAX system was developed by Graeme Ferguson, Roman Kroitor, Robert Kerr, and William C. Shaw. During Expo 67 in Montreal, Kroitor's In the Labyrinth and Ferguson's Man and the Polar Regions both used multi-projector, multi-screen systems. Each encountered technical difficulties that led them to found a company, initially called "Multiscreen", with a primary goal of designing and developing a simpler approach. The single-projector/single-camera system they eventually settled upon was designed and built by Shaw, based upon a novel "Rolling Loop" film-transport technology purchased from Australian inventor Ronald Jones. Later,[when?] when it became clear that a single, large-screen image had far more impact than multiple smaller ones, Multiscreen changed its name to IMAX. Tiger Child, the first IMAX film, was demonstrated at Expo '70 in Osaka, Japan. The first permanent IMAX was in the Cinesphere at Ontario Place in Toronto in 1971, and is still in operation. During Expo '74 in Spokane, Washington, a very large IMAX screen that measured 90 × 65 m (300 × 213 ft) was featured in the US Pavilion (the largest structure in the expo). About 5 million visitors viewed the screen, which covered the viewer's total vision field when looking directly forward. This created a sensation of motion in most viewers, and motion sickness in some. An IMAX 3D theatre also is in operation near the former Expo 67 site at the "Montreal Science Centre" in the Port of Old Montreal. 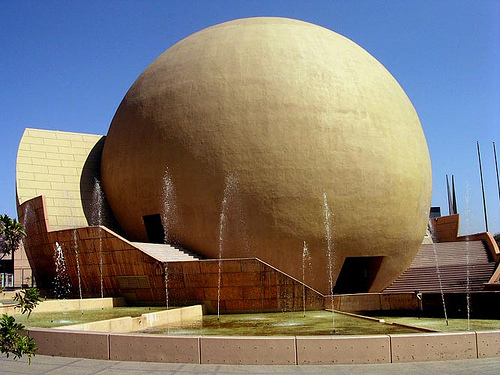 The first permanent IMAX Dome installation, the Eugene Heikoff and Marilyn Jacobs Heikoff Dome Theatre at the Reuben H. Fleet Science Center, opened in San Diego's Balboa Park in 1973. It doubles as a planetarium. 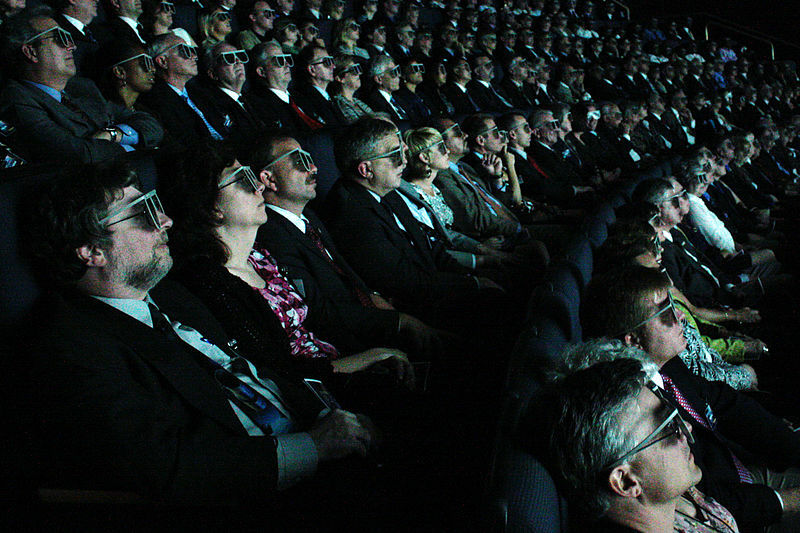 The first permanent IMAX 3D theatre was built in Vancouver, British Columbia for Transitions at Expo '86, and was in use until 30 September 2009. It was located at the tip of Canada Place, a Vancouver landmark. As China is now the second largest market after USA with roughly 25 IMAX theatres located throughout the country, IMAX aims to attract more viewers by decreasing the admission prices in China. 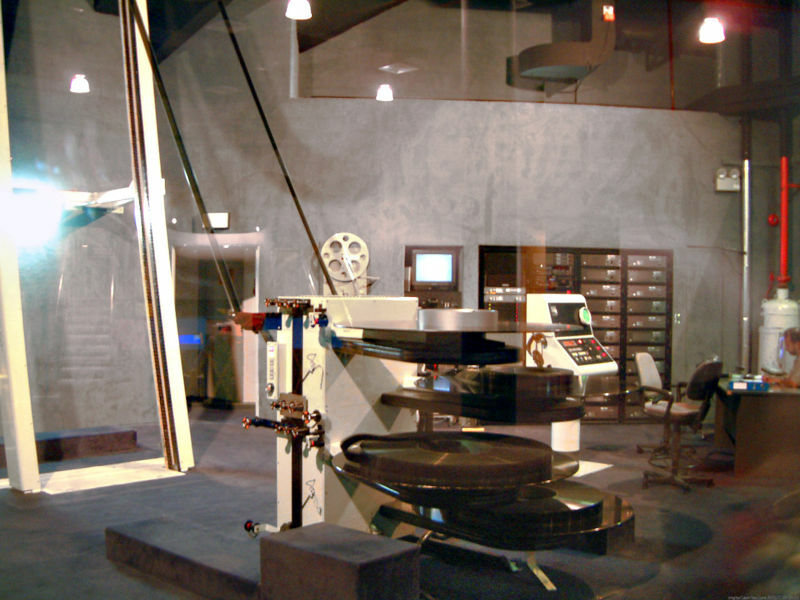 The IMAX format in the USA has traditionally been employed for specialty applications. The expense and logistics of producing and presenting IMAX films has led to approximately 40 minute shorter running times than conventional films. The majority tend to be documentaries that are suited for institutional venues such as museums and science centers. IMAX cameras have orbited the earth, climbed Mount Everest, explored the bottom of the Atlantic Ocean, and visited the Antarctic. An IMAX documentary about the success of the Mars Exploration Rovers was released in 2006, titled Roving Mars and used exclusive data from the Rovers. One of the first attempts at presenting entertainment in the IMAX format was The Rolling Stones: Live at the Max (1991), an 85-minute compilation of concert footage filmed in IMAX during the band's 1990 Steel Wheels tour, edited to give the impression of a single concert. In the 1990s more entertainment short films were created, notably T-Rex: Back to the Cretaceous (directed by Brett Leonard), in 1998 and Haunted Castle, released in 2001 (both in 3D). In 1999, The Old Man and the Sea became the first IMAX animated film and proceeded to win an Oscar. The same year, Disney produced Fantasia 2000, the first full-length animated feature initially released exclusively in the IMAX format. Disney released the first 2D live–action IMAX entertainment film, Young Black Stallion, in late 2003. IMAX increases the resolution of the image by using a much larger film frame. To achieve this, 65 mm film stock passes horizontally through the cameras. Traditional cameras pass film vertically. 65 mm film has an image area that is 48.5 × 22.1 mm (1.91 × 0.87 in) (for Todd-AO), in IMAX the image is 69.6 × 48.5 mm (2.74 × 1.91 in) tall. In order to match standard film speed of 24 frames per second, three times the length of film moves through the camera. IMAX uses "ESTAR" (Kodak's trade name for PET film) base. The reason is for precision more than strength. Developing chemicals do not change the size or shape of ESTAR, and IMAX's pin registration (especially the cam mechanism) does not tolerate either sprocket-hole or film-thickness variations. The IMAX format is generically called "15/70" film, the name referring to the 15 sprocket holes per frame. The film's bulk requires platters rather than conventional film reels. IMAX platters range from 1.2 to 1.83 meters (3.9 to 6.0 ft) diameter to accommodate 1 to 2.75 hours of film. Platters with a 2.5 hour feature film weigh 250 kilograms (550 lb). In order to use more of the image area, IMAX film does not include an embedded soundtrack. Instead, the IMAX system specifies a separate six-channel 35mm (1.377 inch) magnetic film synchronized to the film. This is the same technology as was used to provide the 7-channel soundtrack for Cinerama. By the early 1990s, a separate digital 6-track source was used, locked to the projector by a SMPTE time code synchronization system. The audio plays off a hard disk drive as a single uncompressed audio file containing the 6 channels, which are converted directly to analogue rather than using a decoding method such as Dolby Digital. 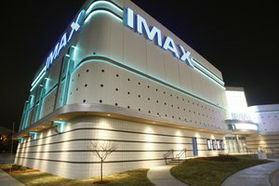 IMAX theatres place speakers both directly behind the screen and around the theatre to create a three-dimensional effect. Drawing the large film through the projector presented challenges for both the camera and the projector. Conventional 70 mm systems were not steady enough for the 586× magnification. On the projector side, William Shaw adapted an Australian patent for film transport called the "rolling loop" by adding a compressed air "puffer" to accelerate the film, and put a cylindrical lens in the projector's "aperture block". The projector uses a vacuum to pull the film into contact with this lens. Thus the "field flattener" flattens the image field. The lens is twice the height of the film and connects to a pneumatic piston so it can be moved up or down while the projector is running. This way, if a piece of dust comes off the film and sticks to the lens, the projectionist can switch to the clean side of the lens at the push of a button. The lens also has "wiper bars" made of a felt or brush-like material which can wipe dust off the lens as it moves up or down. IMAX projectors are pin stabilized, meaning four registration pins engage the perforations at the corners of the projected frame to ensure perfect alignment. Shaw added cam–controlled arms to decelerate each frame to eliminate the microscopic shaking as the frame "settled" onto the registration pins. The projector's shutter is open around 20% longer than in conventional equipment and the light source is brighter. The xenon short-arc lamps are made of a thin layer of fused quartz and contain xenon gas at a pressure of about 25 atmospheres (367 PSI); because of this, projectionists are required to wear protective body armor when changing or handling these in case the lamp breaks (e.g., due to a drop to the floor) because of the danger from flying quartz shards when propelled by the high pressure of the Xenon gas within. An IMAX projector weighs up to 1.8 t (2.0 short tons) and is over 178 cm (70 in) tall and 195 cm (77 in) long. IMAX theatre construction differs significantly from conventional theatres. The increased resolution allows the audience to be much closer to the screen; typically all rows are within one screen height; conventional theatre seating runs 8 to 12 screen heights. Also, the rows of seats are set at a steep angle (up to 30° in some domed theatres) so that the audience is facing the screen directly. 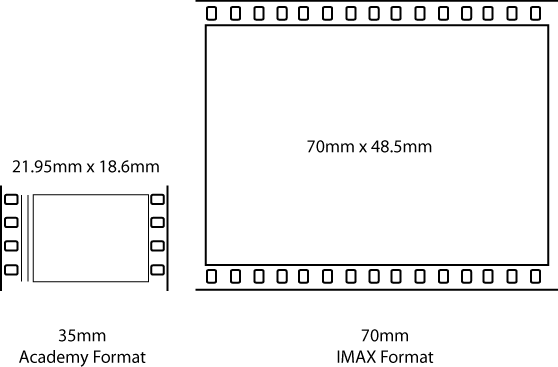 A standard IMAX screen is 22 × 16.1 m (72 × 52.8 ft), but can be larger. The world's largest cinema screen (a 15/70 mm IMAX) is the LG IMAX Theatre in Sydney, Australia. It is approximately eight stories high, with dimensions of 35.73 × 29.42 m (117.2 × 96.5 ft) and covers an area of more than 1,015 m2 (10,930 sq ft). The largest digital IMAX screen, almost 100 feet (30 m) wide, is located at the Warren Theatres in Wichita, Kansas. IMAX theatres are described as either "Classic Design" (purpose-built structures), or "Multiplex Design" (retrofitted auditoriums). 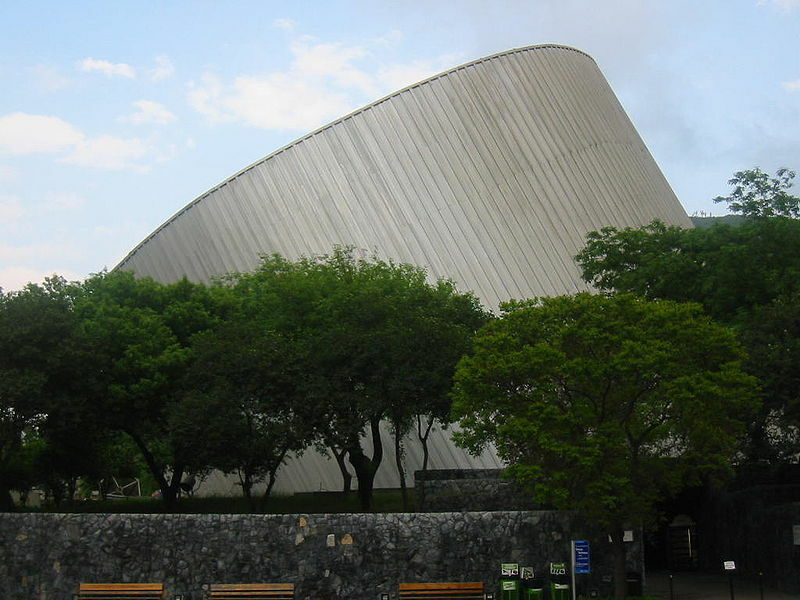 Planetario Alfa, Museum, Astronomical observatory and IMAX Dome system, Monterrey, N.L., México. In the late 1960s the San Diego Hall of Science (now known as the Reuben H. Fleet Science Center) began searching North America for a large-format film system to project on the dome of their planned 76 ft (23 m) tilted dome planetarium. The standard IMAX projector was unsuitable for use inside a dome because it had a 12 ft (3.7 m) tall lamp house on top. IMAX Corporation redesigned its system, adding an elevator to lift the projector to the center of the dome from the projection booth below. Spectra Physics designed a suitable lamphouse that took smaller, 18 in (46 cm) lamps and placed the bulb behind the lens instead of above the projector. In 1970, Ernst Leitz Canada, Ltd. (now ELCAN Optical Technologies) won a contract to develop and manufacture a fisheye lens projection system optimized to project an image onto a dome instead of a flat screen. The dome system, which the San Diego Hall of Science called OMNIMAX, uses films shot with a camera equipped with a fisheye lens on the camera that squeezes a highly distorted 180° field of view onto the 65 mm IMAX film. The lens is aligned below the center of the frame and most of the bottom half of the circular field falls beyond the edge of the film. The part of the field that would fall below the edge of the dome is masked. When filming, the camera is aimed upward at an angle that matches the tilt of the dome. When projected through a matching fisheye lens onto a dome, the original panoramic view is recreated. OMNIMAX wraps 180° horizontally, 100° above the horizon and 22° below the horizon for a viewer at the center of the dome. OMNIMAX premiered in 1973 showing Voyage to the Outer Planets (produced by Graphic Films) and Garden Isle (by Roger Tilton Films) on a double bill. The biggest IMAX dome theater in the world is the Hackworth IMAX Dome theater at the Tech Museum in San Jose, CA. OMNIMAX theatres inhabit theme parks and North American museums, particularly those with a scientific focus, where the technical aspects of the system may be highlighted as part of the attraction. The projection room is often windowed to allow public viewing and accompanied by informational placards like other exhibits. The screen may be a permanent fixture, such as at the St. Louis Science Center and Boston's Museum of Science; or lowered and raised as needed, such as at the Science Museum of Minnesota (where it shares an auditorium with a standard IMAX screen). Before the feature begins, the screen can be backlit to show the speakers and girders behind it. While the majority of museum installations focus on educational and documentary films, on special occasions, entertainment films are also shown, such as Charlie and the Chocolate Factory at the Oregon Museum of Science and Industry. The largest in North America are at the Liberty Science Center in Jersey City, New Jersey and the Telus World of Science in Vancouver, BC, both of which have 88 feet (27 m) dome screens. To create the illusion of depth, the IMAX 3D process uses separate camera lenses to represent the left and right eyes. The two lenses are separated by an interocular distance of 64 mm (2.5 in), the average distance between a human's eyes. Each lens feeds a separate roll of film. By projecting the two films simultaneously, viewers experience seeing a 3D image on a 2D screen. The IMAX 3D camera weighs over 113 kg (250 lb). One method of creating the 3D illusion involves polarizing the light from the two images. During projection, the left and right eye images are linearly polarized as they are projected. Eyeglasses with right and left lenses polarized to match the projection present each eye with just the image intended for that eye since the polarization cancels out the other eye's image. Alternatively the two projectors take turns displaying each frame (while one projector's image is displayed, the other is blocked) at an effective rate of 48 frames per second. The viewer dons LCD shutter glasses that contain LCD panels that block or transmit light in each eye in sync with the projector, such that each eye only sees the image intended for it. Several films produced in a smaller-format 3D process for release in conventional theatres have also been presented in IMAX 3D, including Toy Story 3, Tron: Legacy, Transformers: Dark of the Moon and Avatar. Some IMAX theatres further enhance the viewing experience by moving and/or vibrating the seats at opportune moments. Variations on IMAX included the 48 frames per second IMAX HD process, which sought to reduce strobing and offer higher definition by doubling the normal film rate. The IMAX HD system was tested in 1992 at the Canada Pavilion of the Seville Expo '92 with the film Momentum. Higher production costs, and the high wear-and-tear on the prints and projectors, doomed the IMAX HD system, but, not before many theatres had been retrofitted to project at 48 frames, especially in Canada, in order to play Momentum.In the 1990s theme parks in Thailand, Germany, and Las Vegas used IMAX HD for their Motion Simulator rides. The Disney parks attraction Soarin' Over California features a modification of both IMAX HD and IMAX Dome, projecting in 48 frames per second. The doubled IMAX HD frame rate means that each IMAX HD reel lasts half as long, and the logistical implications of this reach throughout the film production chain. IMAX production by default is at least 3 to 5 times more expensive than common 35mm production. The further increase in IMAX HD has prevented significant adoption. In 2002, IMAX and Universal Studios released an IMAX-format version of the 1995 film Apollo 13, the first application of IMAX's proprietary DMR (Digital Media Remastering) process, which allows conventional films to be upconverted into IMAX format. This special digital intermediate technology allowed films shot on 35mm for conventional theatres to be shown in IMAX venues. Because of a technical limitation on the size of the film reel, several early DMR releases were shortened to less than two hours. Later releases did not have this limitation; current IMAX platters allow a run time of up to 170 minutes where films could run longer in IMAX Digital venues. Reviewers have generally praised the results of the DMR blowup process, which are visually and audibly superior to the same films projected in 35mm.But some filmmakers, such as producer Frank Marshall, point out that DMR blowups are not comparable to films created directly in the 70 mm 15 perf IMAX format, and that directors Ron Howard and George Lucas expected better. They note that the decline of Cinerama coincided roughly with its replacement by a simpler, cheaper, technically inferior version, and view DMR with alarm. IMAX originally reserved the phrase "the IMAX experience" for true 70 mm productions, but now allows its use on DMR productions as well. Since 2002 many Hollywood films have been remastered for IMAX. Warner Brothers (WB) has especially embraced the format with the two Matrix sequels, and since 2004 has been releasing its Harry Potter film franchise in IMAX to strong financial success. Also in 2004 the company released the animated film The Polar Express in IMAX 3D. Express became the most successful film to be released in IMAX theatres, producing at least a quarter of the film's gross of $302 million from less than 100 IMAX screens. In 2005 WB released Batman Begins simultaneously in conventional theatres and IMAX. In summer 2006, WB released Superman Returns remastered for IMAX, with some effects scenes transformed into 3D. Spider-Man 3 (2007) was also remastered for IMAX. The July 2008 Batman Begins sequel The Dark Knight (partially shot on IMAX—see below) broke box office records for IMAX, taking in about $6.3 million from 94 theatres in the U.S. and Canada over the opening weekend. The record for an IMAX opening weekend was again broken in May 2009 by Star Trek: The IMAX Experience, which took in $8.3 million. Harry Potter and the Deathly Hallows Part 2 in IMAX has since grossed $15.5 million. Some recent features have employed IMAX cameras for selected scenes, however no full-length feature film has yet been shot entirely using IMAX cameras due to the numerous difficulties presented with the format - the cameras are much larger and heavier than standard cameras and as they are noisier it makes dialogue recording difficult. The cameras have short film loads ranging from 30 seconds to two minutes and the cost of the film stock is much greater than standard 35mm film. The Dark Knight featured six sequences (a total of 30 minutes) shot using IMAX. According to the film's press notes, this was the "first time ever that a major feature film has been even partially shot using IMAX cameras". Michael Bay's 2009 film Transformers: Revenge of the Fallen also included scenes shot in IMAX. The slightly longer version playing in IMAX theatres included about nine minutes of IMAX footage. Brad Bird's Mission: Impossible – Ghost Protocol had approximately 30 minutes of footage shot using IMAX cameras. Bird believed that using IMAX format would bring back "a level of showmanship" to the presentation of Hollywood films, which he believes the industry has lost due to its emphasis on screening films in multiplexes as opposed to grand theaters, and vetoing "first runs" in favor of wider initial releases. Upcoming films that will be partially shot in IMAX include Christopher Nolan's The Dark Knight Rises (the sequel to Batman Begins and The Dark Knight), J.J Abrams Star Trek sequel, and John Woo's Flying Tigers. A digital version debuted in 2008. The new system is a projection standard only. Digital IMAX systems can show either 2D or 3D content in DCI or IMAX digital format (which in itself is a superset of DCI). The digital system alleviates the need for film reels and facilitates inexpensive distribution of IMAX features. The digital installations have caused some controversy, as many theatres have branded their screens as IMAX after merely retrofitting standard auditoriums with IMAX digital projectors. The screen sizes in these auditoriums are much smaller than those in the purpose-built auditoriums of the original 15/70 IMAX format. These theatres charge the same premium pricing as the purpose-built IMAX theatres, resulting in consumer confusion. IMAX marketing makes no distinction between the new smaller digital installations and the original format. Some high profile figures such as actor Aziz Ansari and film critic Roger Ebert have also actively voiced their concerns. Another disadvantage is a lower resolution than normal IMAX film, estimated to be about 12,000 × 8,700 theoretical pixels or 6,120 × 4,500 actually discernible pixels. IMAX digital currently uses two 2K-resolution Christie projectors with Texas Instruments Digital Light Processing technology alongside parts of IMAX's proprietary technologies. The two 2K images are projected over each other, producing an image that is potentially brighter 2K digital cinema. Originally, IMAX considered using two Sony 4K projectors. Some reviewers note that this approach does not produce image quality higher than single 4K projectors, which are available for some non-IMAX theatres. In early January 2010, IMAX announced a 3D digital camera, with expected availability in 2011. The camera is expected to reduce production and projection costs by eliminating the use of film. In 1996 IMAX was awarded the Oscar for Scientific and Technical Achievement by the Academy of Motion Picture Arts and Sciences. 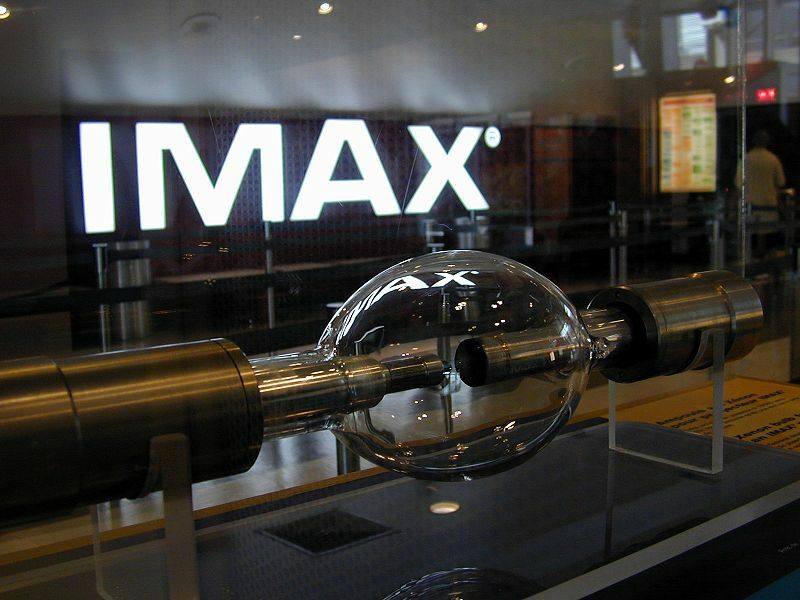 The award cited IMAX's innovations in creating and developing a method of filming and exhibiting large-format, wide-angle motion pictures. Many IMAX films have been remastered into HDTV format (cropped to fit into HDTV's 16:9 aspect ratio) for the MOJO HD, HDNet and HD Theatre networks. Several amusement park attractions have integrated IMAX film segments, including Back to the Future: The Ride formerly at Universal Studios in Florida and California, Horizons, formerly at Epcot Center, Soarin' Over California at Disney California Adventure Park and Epcot and Harry Potter and the Forbidden Journey at the Wizarding World of Harry Potter within Islands of Adventure in Florida.